If you are at all familiar with the compensation plan of other network marketing companies, you’ll find the doTERRA compensation plan to be refreshing and rewarding. The basis of the plan is that you don’t succeed unless you help others succeed. There are five ways to earn commission with the doTERRA Compensation Plan. They are independent of each other. You are allowed to buy doTERRA at the wholesale cost and sell it for however much you can get for it, as long as it’s at least 10% above wholesale, and you can make a profit that way. This would be a great option if you have a store, are a midwife, sell at a craft fair or you are a chiropractor or massage therapist with clients. You can also refer people to your own doTERRA store that you will receive when you sign up as a Wellness Advocate and if they want to purchase the items at the retail cost so they don’t have to sign up or anything, doTERRA will ship the items directly to them and you will receive the 25% different between the wholesale cost and the retail cost. When you sign up, you are given a link to your store that you can post online at places like Facebook, Pinterest or a blog. You get 25% commission on any/all of these orders placed with your ID#. To receive this you must be an active WA but no monthly order or LRP is required. The doTERRA store is also your doTERRA website. After you log in to doterra.com, click on “Account Profile” then scroll down to “My Site Address” and you can get the link to your website. Then you can give anyone that link and they can buy at retail cost, which is 25% above your wholesale cost. doTERRA ships the orders and you get the 25% difference between retail and wholesale. As long as you have a 100 PV LRP order yourself, then you receive 20% of what new WAs purchase in the first 60 days. This can be huge because WA’s generally purchase a lot at the beginning so they can try the different things out. You receive 20% on purchases made within the first 60 days by WA’s that you enroll. The person who enrolled you receives 10%, and the person who enrolled that person receives 5%. This is why it is good to keep signing up new WA’s (enroller based). Fast Start payments are processed on Wednesday (covering the prior Monday-Sunday) and mailed/deposited on Thursday. In order to receive Fast Start commissions, you must have an LRP order of at least 100 PV in place at all times and must process once during the month. To explain it graphically, if this little green person is you and you have shared the oils with three people, you want to do those 100 points a month so you can get a $50 bonus. It’s a bonus on top of the regular paycheck. Once each of these three dark blue guys has shared the oils with 3 people each who want to do the 100 points a month, you are getting $250 a month bonus, which is awesome because you are more than covering what you are wanting to buy every month. So once these 9 people have shared it with 3 people each who want to do the 100 points a month, now you are up to $1500 a month and that is a significant income for most households. Unilevel is sponsor-based. Payment of unilevel is dependent upon three things: OV; Rank and a LRP order in place. When you first start out with doTERRA, this is a very small percentage of your paycheck. Most of your check will probably come from Fast Start bonuses and Power of 3 bonuses. But as your business grows and especially as it gets deeper, your unilevel bonus will get larger and larger. The top Wellness Advocates make around 80% of their income from unilevel – and that’s saying a lot because they get around $4,000 in bonus pool income when they are a Diamond and the levels above that get even more. Consultant (Level 1) – You must have a 50 PV LRP order process. You are paid 2% of everything that the WA’s you personally signed up purchase (after the first 60 days). Manager and Above (Levels 2-7) – If you can get someone you signed up to sign someone else up, then you will want to move up to the Manager position or you won’t receive the 3% payout from your 2nd level. You need your own 100 PV LRP monthly order and at least 500 OV. doTERRA is unique because you actually get a higher percentage the farther down the line the WA’s are – they do this to motivate you to build your team. You are paid the % on the chart for each level as long as you meet the rank requirements at the top of the page. You can look in the doTERRA back office at any time and see what rank you are and what it takes to get to the next rank. This is paid on the 15th of the next month. You received one combined check on the 15th for everything except Fast Start. 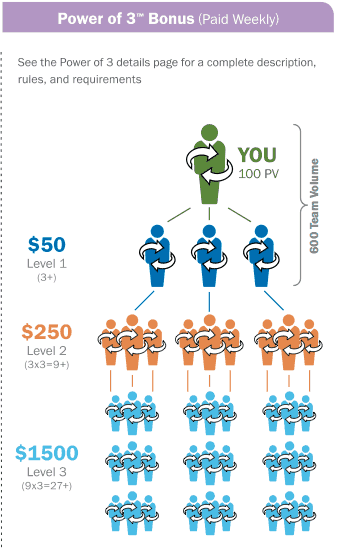 Compression – this means that if you have someone under you that doesn’t do their 100 PV LRP order, what they would have been paid in bonuses moves up to you. So you can actually get paid several levels lower than 7 levels. Bonus pools start once you hit Silver. Once you reach the Silver level, you’re pretty awesome in the doTERRA world. You get to go in the special line at Pick Up in Orem, UT. You can attend special Silver and above training and several other things. But the main reason you want to be a Silver is that you then are a part of the Leadership Performance Pool. They take all the sales for that month and multiply it by 2%. Then all the Silvers get at least one share in this pool. Then as you work your way up you get even more shares. Right now a Silver share is around $130. That means a Gold gets about $650 and a Platinum gets $1300. The Diamond Pool share is around $4,000 per share. Thanks for reading and learning about the doTERRA compensation plan. I think it is fair, although a little tricky at times to understand. What is your favorite part? Please comment below and let me know what you think! All these ways to earn money are paid with actual money. The fast start bonus is actually paid weekly on the week following their enrollment. All others are paid monthly on the month following the month you earned it. The default is payment via check, but they take out like a $2 fee for that, so most people opt to have it direct deposited cause there is only a 50 cent fee for it. Or, I believe you can even tell them you only want to be paid once your account meets a minimum, just so you don’t have to pay the 50 cents on a super small amount of money. In order to be paid, you need to have your tax id on file with them, so they can issue a 1099 at the end of the year if you are paid over $600 in a year. So, if you don’t have that on file, they will hold your money until you give that to them, but they will let you know they are holding your money, so you can hurry and get it to them. I think that pretty much covers it . . .
Hi i am unfamiliar with the “preferred membership” option can you direct me to more info? Thank yoi! I’m glad you asked. I didn’t realized that was still on here. They don’t have that option any more, so I need to update this article. Thanks for the heads-up. I was wondering who, if anyone, receives compensation if a doTERRA customer orders products directly from the company website and not from an independent seller’s personal website? If a person does not have a direct upline, then no one earns commissions from their orders. If they order from the company website, they are given an option to put someone in as a referrer and they will get credit. Hi! I’m thinking of starting my own essential oils blog and so thankful for your site! Very inspiring. Question- I’m not really interested in recruiting others to sell doTERRA. Can I still make a good amount of income from just the “fast start bonus”? A decent amount but really the uni-level bonus can add up for you and if you get enough sign-ups yourself you can build a whole team without having to get those under you to sign up. Yes, it’s slower but it can be done. Plus, some people will naturally sign up others as they experience the oils and tell their family and friends. Most won’t sign up tons of people but it can add up over time.